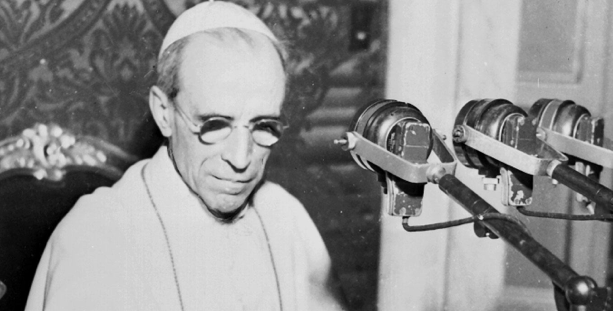 © Vatican Radio – Recordings of the voice of Pope Pius XII on this Site are property of Vatican Radio and belong to its Archive of Popes’ voices. To it belong all rights relating to the use of those records, which are made ​​available solely for personal listening. The download tasks of audio recordings of Pope Pius XII are allowed only for private use. Forbidden any other use or exploitation of the sound material in question. Precibus et meritis beatæ Mariae semper Virginis, beati Michaelis Archangeli, beati Ioannis Baptistæ et sanctorum Apostolorum Petri et Pauli et omnium Sanctorum, misereatur vestri omnipotens Deus et dimissis omnibus peccatis vestris, perducat vos Iesus Christus ad vitam æternam. Indulgentiam, absolutionem et remissionem omnium peccatorum vestrorum, spatium veræ et fructuosæ pænitentiæ, cor semper pænitens et emendationem vitae, gratiam et consolationem sancti Spiritus et finalem perseverantiam in bonis operibus, tribuat vobis omnipotens et misericors Dominus.